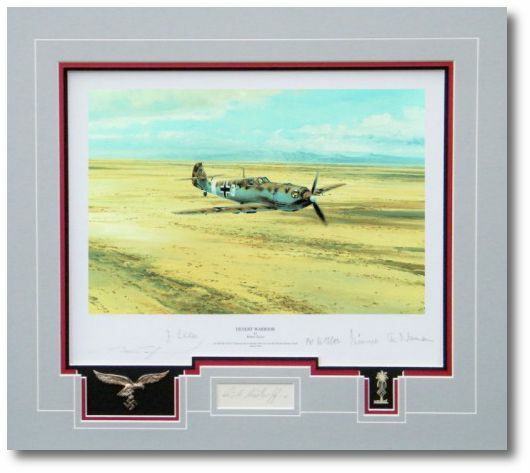 Each Collectors Edition is issued conservation matted to include the original autograph of Major Erich Rudorffer. On the Remarque and Double Remarque editions, Robert will hand-craft an original pencil drawing on a separate sheet of paper which will be delicately set into the conservation matting with all components of the Collector�s Edition. Overall size (print): 18" x 13 1/2"
Approx. matted size: 21 1/4" x 19"
With Mussolini�s army faring badly in North Africa, Hitler quickly recognised that he would have no option but to give his Italian ally substantial military assistance. It came in the form of Generalleutnant Erwin Rommel who, on 12 February 1941, landed in Tripoli ready to take command of a new German army being dispatched to Libya. Its name was soon to be famous around the world � the Afrika Korps. Assigned to their support was I./JG27 under the command of Eduard Neumann, one of the most respected Luftwaffe fighter leaders of World War 2. The Gruppe was made up of veterans who�d taken part in the French campaign and the Battle of Britain so it didn�t take long for Neumann�s pilots to make their presence felt; on their first combat mission from Ain el-Gazala on 19 April they claimed the destruction of four RAF Hurricanes and in the process notched up the Gruppe�s 100th victory of the war so far. With the arrival of the rest of the Gruppe from Russia at the end of 1941, JG27 would spend the next year defending Rommel�s front line in North Africa, their name indelibly linked to the Western Desert. And it was here that Neumann would mentor Hans-Joachim Marseilles who, awarded the Knight�s Cross with Oak Leaves, scored all but seven of his 158 victories in the Western Desert to become one of the highest-scoring Luftwaffe Aces in history. 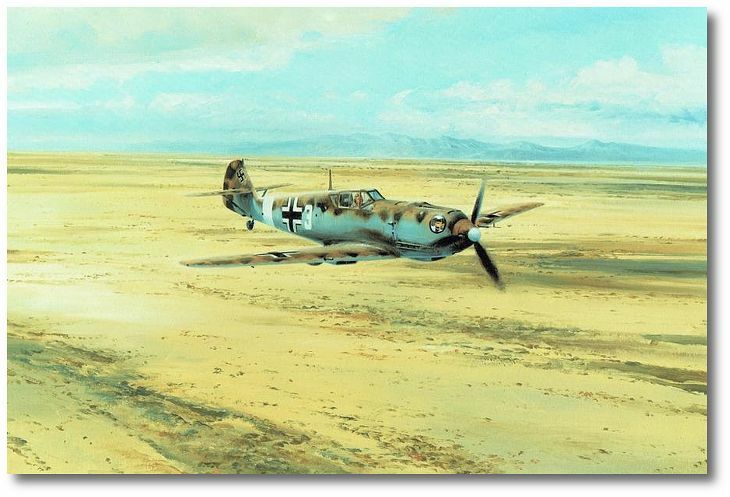 Previously unreleased, Desert Warrior was painted in 1986, a period of his career that included some of Robert�s most famous Luftwaffe pieces such as JG-52 (1986), Ace of Aces (1988), Swansong (1988), The Abbeville Boys (1989), Stuka (1990) and Gathering Storm (1990). Robert fittingly depicts a Bf109 from I./JG27 near their base in north-east Libya, a small dusty village near the coast called Ain el-Gazala, from which they were tasked to protect the Ju87 Stukas attacking the encircled British army in Tobruk, just 40 miles away.